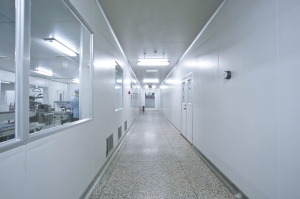 CPT composite panels are ideal for clean rooms, controlled and uncontaminated environments where non-out gassing and chemical resistance are critical features. Panels can be designed to be anti-static, lightweight and modular. CPT panels can be used to create a stand-alone clean rooms structures complete with extrusions, or can be applied over an existing structure. CPT panels can be used for floors, walls, ceilings, partitions, and doors. The modular design of a clean rooms composite panel system allows for easy installation and quick implementation time. CPT does not offer a turnkey solution for clean rooms assembly, but will work within your design specifications to provide a product that will work for your unique requirements. CPT composite panels offer the widest range of core and skin materials in the industry to provide custom solutions for the clean rooms industry. CPT can supply panels in raw sheet form, or provide the panels pr-cut to profile and size or fitted with edge trimming as a finished completed assembly. Our highly experienced sales and engineering teams can assist you in choosing the best composite panel or panel system to meet your requirements.